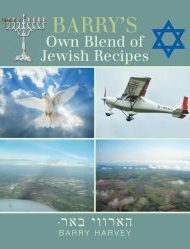 Barry Harvey, a disabled veteran of the British RAF and former chef, has assembled over 100 recipes inspired by his Jewish and Austrian roots in his slim cookbook Barry’s Own Blend of Jewish Recipes. In the book’s introduction (written in prose that is heartfelt and amiable but extremely hard to follow due to grammatical errors and disorganization), Harvey offers tips on cooking and how to use the book, as well as biographical information about serious surgeries he has undergone. The book is a tribute to Harvey’s parents and grandparents as well as the extended family that helped him during a long and difficult post-surgical recovery. The recipes that follow feature traditional Jewish dishes from Harvey’s memory: chopped liver, gefilte fish, latkes, stuffed cabbage, brisket, chicken noodle soup, and matzo balls. Desserts include rugalasch, hamantaschen, and Austrian griesstorte. There’s also a smattering of classic British favorites such as Bubble & Squeak Soup and Cornish pasty. For international fare, Harvey offers twists on paella, empanadas, curries, kofta, and pasta, but most recipes are a “Barry’s Version” that sets aside authenticity in favor of simple, easy-to-execute preparation. Cooking from these recipes may be frustrating, as they are complicated by poorly written directions that lack clarity with regard to sequencing and method of incorporating ingredients. Also, there are no themed chapters or index to help readers find categories of recipes. Recipes are reminiscent of those one’s bubbe (grandmother) scribbles on an index card; however, those armed with the spirit of experimentation will find that they can be deciphered and enjoyed. Harvey includes useful English to American conversion tables for temperature, dry ingredients, and liquid measures, a labeled diagram illustrating prime cuts of beef; tips for cooking steak, tips for marinades, a list of essential spices, and a tiny glossary of Jewish cooking terms. In gratitude to those who helped him through his illness, Harvey is donating some of the book’s proceeds to the RAF Association and Help for Heroes.